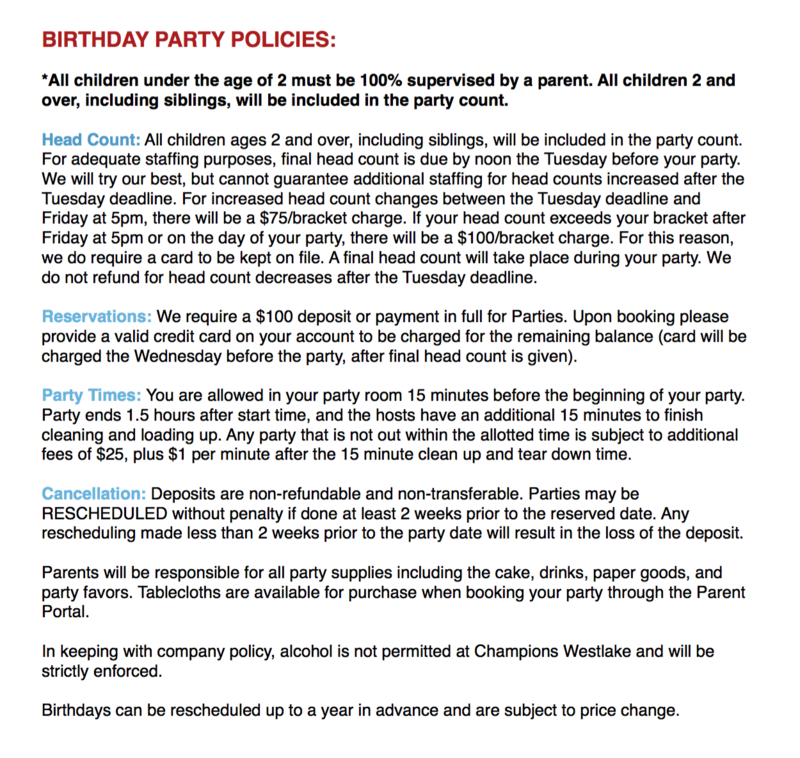 Celebrate your Special Day at Champions Westlake! Champions Westlake provides gym time supervised by certified instructors at each station. Hands-on instruction is offered at stations including the bars, beam, foam pit, and more! All ages – tikes to teens – have a blast! Our largest party room accomodates up to 32 children, This room includes child-size tables and chairs, access to adult-size chairs, direct access to the floor space on the ground level, two in-room bathrooms with a changing station, and up to three coaches during instructed gymnastics floor time. This large, second floor space accomodates up to 32 children and has access to the stairs* and rear gym entry. This room includes cafeteria-style tables, and provides up to three coaches during instructed gymnastics floor time. This upstairs space accomodates up to 16 children, and provides the convenience of a kitchenette with access to stairs* and the rear gym entry. This room includes tables, chairs, and provides up to two coaches during instructed gymnastics floor time. This upstairs* space, near the front of the gym, accomodates up to 16 children (ages 8+), and is located near the front stairs and gym entry. This package exclusivly uses our team gym during party times. This room includes an adult-size table and seating, and provides up to two coaches during instructed gymnastics floor time. Need help deciding on your perfect party package? Give us a call at 512-426-1990 and we’ll help you find the one that works best for you!